If it made sense, it wouldn't have to be a religion, now would it? The miracle-mongers are ever with us, relying on faith because evidence fails. Believing in miracles is harder work than you might think, since we are told they are everywhere around us. Such ubiquity should keep us in a constant state of wonder and adoration. But no. Transubstantiation and Virgin Mary apparitions in tortillas and oil stains fail to impress. Most (all?) of these miracles fall prey to more parsimonious explanations than divine intervention. The Roman Catholic Church, which has cornered the market on the creation of saints, has to settle these days for nothing more exciting than unexplained recoveries from serious illnesses in cataloguing miracles in the canonization casebooks. The only really good miracles remain confined to the pages of the various holy books. The Bible, for example, offers such decidedly remarkable events as the healing of lepers, the bestowing of sight on the blind, the restoration of a severed ear, and even resurrection from death. Those are definitely good miracles, but we never see the like today. This appears not to trouble the irremediably devout. Cartoonist Johnny Hart continues to find something ostensibly humorous in the doubts of nonbelievers and likes to use the panels of his B.C. 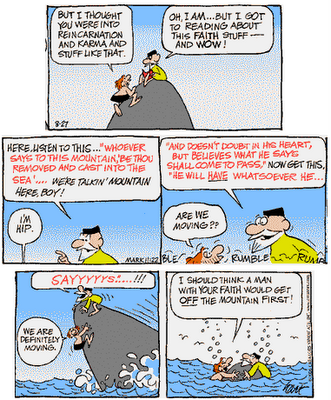 comic strip to preach at his readers. Today's installment is unusual in that it goes beyond his customary sermonette (see his stillborn sally at science, for example). Hart doesn't just lament the absence of miracles in contemporary life—he does something about it! All of you doubters out there should feel properly chagrined now. As we can plainly see, a pagan mountain-sitting guru can, after a brief perusal of a complimentary Gideon Bible, generate so much godawful faith that he can topple his mountain into the sea! Ye of little faith had better sit up and take notice, because Johnny Hart's cartoon god is a mighty god. We know this, because it can perform stupendous miracles on behalf of its believers. Mountains into the sea! Wowee! If I hadn't seen it for myself, I would never have believed it. See you in the funny papers. The Bible, for example, offers such decidedly remarkable events as the healing of lepers, the bestowing of sight on the blind, the restoration of a severed ear, and even resurrection from death. Those are definitely good miracles, but we never see the like today. Sure we do. They're called "Miracles of Science." 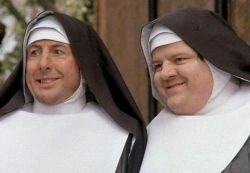 The only thing I recall from Nuns on the Run is how Robbie Coltrane remembers to cross himself: "Spectacles, testacles, wallet and watch." Well, shucks. Hobo. Thanks for the kind words. Step One: Write "Faith" on a gran of mustard seed. Step Two: Drop mountain on Rush Limbaugh. I hope one mountain will be enough.